This blog is all about Python-OpenCV tutorials that will get you you started to explore more deep into the topic. My aim is to allow people to feel the water before they dive into an ocean. This blog will let you decide if this thing interest you or not. In this tutorial, we are going to see how to make a logo of OpenCV. Before starting I would like you to try to make logo yourself. You can make logo of some other things like brands or anthing you like. 3) Half of the size of the ellipse main axes a and b given as (a, b). 4) Ellipse rotation angle in degrees. 6) Ending angle of the ellipse arc in degrees. For more info on ellipse(), click here. Line 11 : Closes any open windows. For any queries, Please ask in comment section below. 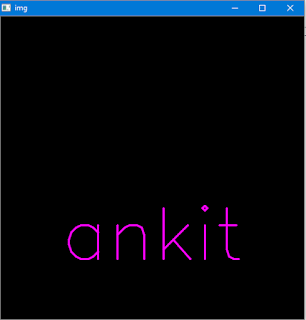 In this tutorial, we are going to see how can we actually write a text like this one below on a canvas(drawing window). Line 4: We need to specify a font we wish to draw in. I encourage you to see list of fonts available in cv2 module to try with other fonts too. That's it for this tutorial. See you in next tutorial which is going to be little interesting. Any queries, please ask in the comment section below. 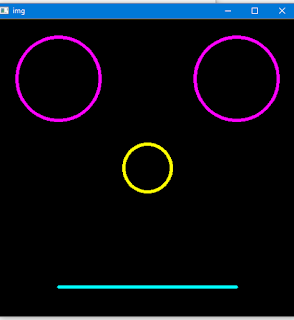 In this tutorial, we are going to see how to make a simple poker face ( Something like this → `_`). Line 1-2: Import necessary libraries cv2 and numpy. Line 3: Create a black surface using np.zeros(). Here, 500 is the height and width of window created which will support 3 color channels i.e. RGB. 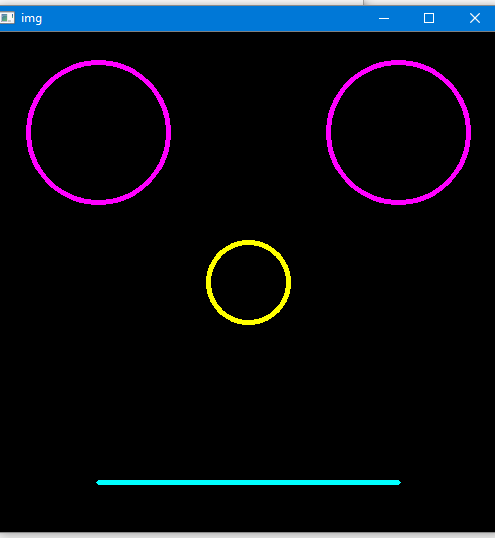 Line 4: Draw a circle with center (100,100) and 70px radius. (255, 0, 255) will give pink color and 3 specifies the thickness of the circle. This circle is going to be the left eye of the poker face. Line 5: Draw another circle with center (400,100) and 70px radius. This will be the right eye of the face. Line 6: Draw another circle with center (250,250) and 40px radius. This will be the nose of the face. Line 7: Draw a straight line from (100,450) to (400,450) co-ordinates. Line 8: Display image using imshow() function. Line 9-10: Hold image infinitely using waitKey(0) and close any open windows using destroyAllWindows(). This will be generated when you run the code. That's it for this tutorial. In the next tutorial, we are going to perform some operations on image. For any queries, use comment section below. 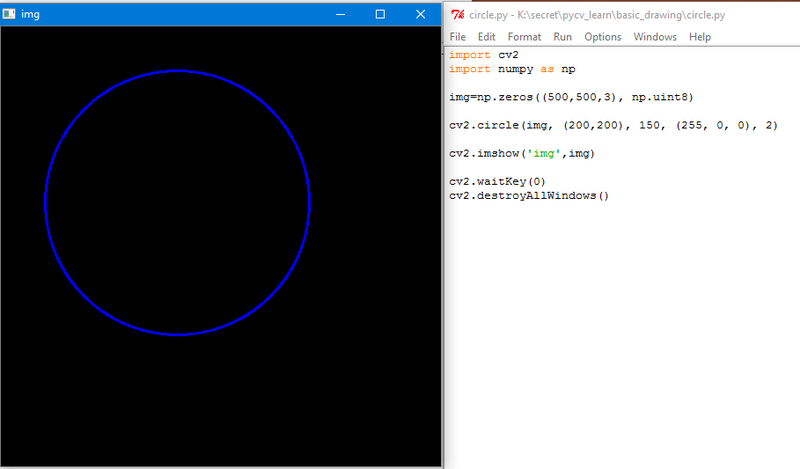 In this tutorial, we are going to see how can we draw a circle using Python, OpenCV and Numpy. Line 3: Create a blank image using np.zeros(). #see previous tutorial to understand how it works. (x,y) is the center of the circle. color defined as (B, G, R). B, G, R represent the intensity of blue, green and red color in your circle. Max intensity is 255 for each color. You can experiment with other value too for different color circles. thickness represents the thickness of the circumference line of the circle. Line 5: Display the picture using imshow() function. Line 6: Hold screen infinitely until user closes it. Line 7: Close any open windows. So that's it for this tutorial. 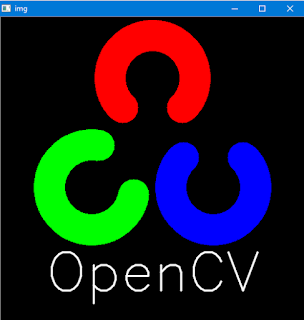 Hope you are learning to use OpenCV with Python and Numpy. See you in my next tutorial where we will learn to draw more complex drawings which will involve use of both circle and line. 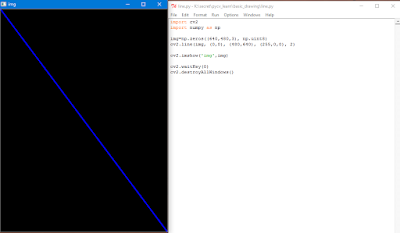 In this tutorial, We are going to see how to draw a line using OpenCV, Python and Numpy. Line 1: Import OpenCV package using "import cv2"
Line 2: Import numpy package using "import numpy as np". Here "np" is just a short name for numpy so if want to call a numpy function zeros() we can simply write np.zeros() instead of numpy.zeros(). It will save your typing in longer codes. It is used to create an empty black image of specified size(Row x Col). We need a surface to draw lines, circle etc. and this function provides us that surface by creating an empty black surface where we can make drawings. channel: specify the type of image. grayscale or color. We pass 3 for color. Line 4: This is the code which actually draws a line on the black surface we made in previous line. end_co-ordinate is the end point of the line for eg. (480,640). Remember that 480 is the column size and 640 is the row size. This is in contrast with what we wrote in np.zeros(). Line 5: Display the image using cv.imshow() method. Line 6: To hold the screen infinitely we pass the argument to waitKey as 0. Line 7: Closes all the open windows, if any. As you can see, we are now able to draw a line using simple operations. That's all for this tutorial, and in next tutorial we are going to learn how to draw a circle. Any queries, please ask in comments section below. Line 3 : This is the most important step as in this step we are providing the info about the codec of video we are going to make. It can be 'XVID', 'MJPG', 'DIVX' and so on. We have defined it as 'XVID'. The function we use for this is cv2.VideoWriter_fourcc(*'<type of file>') where you can replace <type of file> with supported Codecs of Videos in OpenCV. Line 4 : Now we need to specify what will the output i.e. captured video will look like. For this will create a VideoWriter object. This object takes as input the filename(eg. movie.avi) , the FOURCC code, fps(frames per second) i.e the speed of video(eg. 20), and the resolution of the video(eg. (320,160)). Line 6 : Capturing a frame from camera and saving in frame. Line 7 : As we discussed in one of the previous tutorials, ret is a boolean variable which contains True if frame is captured else False. This makes sense as we will only save a frame if it is available. Line 8 : From this line onwards we start saving the video. 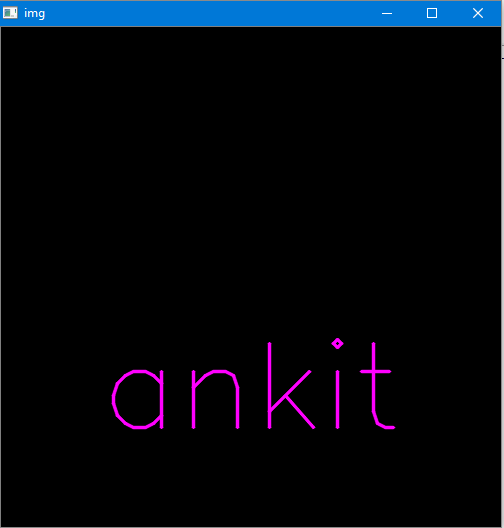 As the name suggest, it write onto the file mentioned in "output" object. Line 9 : Display the frame so that you can see whats been recorded. If you omit this line, you can still record video although you wont be able to see what is being recorded. Line 10-11 : As discussed in previous tutorials, waitKey(40) will hold the whatever is on the screen for 40 millisecond and check whether "ESC"(27 is ASCII for ESC key) key is pressed. If the key is pressed we come out of loop(due to break) and the recording stops too. Line 12-13 : Release the camera and close all windows using these two lines. As you can see, I am playing a file which was created after I run the program. So, that's it for this tutorial. Hope to see you again in my next tutorial which is going to be really interesting so do visit and like my facebook page to stay connected. In this tutorial, you will learn to write a code in Python-OpenCV which can run a video file. Line1: OpenCV library imported first of all. Line2: VideoCapture object 'cap' initialised with file name of the video as the argument of VideoCapture() function. Remember to provide the full path to video file if the video is not in the same folder as the program. Line4: frame is captured from the camera and saved in frame variable. 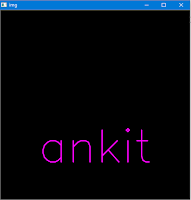 Line5: cv2.imshow() used to display the frame on window named 'frame'. we are out of loop. Line7: break is a jump statement which when encountered bring program execution to the first line after the loop. In this case, its cap.release which is executed as it is the first line after the loop. Line8: cap.release() release the VideoCapture object. Line9: cv2.destroyAllWindows() kills the active windows if any. As you can see the video is playing after running the code. Note that you wont be able to hear the audio because OpenCV is a vision library and not an audio library. Its use is to manipulate the images,videos and not the sound. This tutorial just teaches you the basic things that you need to know about OpenCV and this feature is one of them. That's it for this tutorial. See you in the next one where we are going to capture and save a video using a laptop camera. Any queries please ask in comments.